So in all the years I've been playing Traveller and more likely, playing with Traveller, I've never adventured in a yacht. I'm pretty much a scout and merchant guy and my old gaming friends leaned heavily toward mercenary adventures. I've had firefights on the Azhanti High Lightning, explored several suspiciously derelict lab ships, and even blew up an X-boat once... but no yachts. 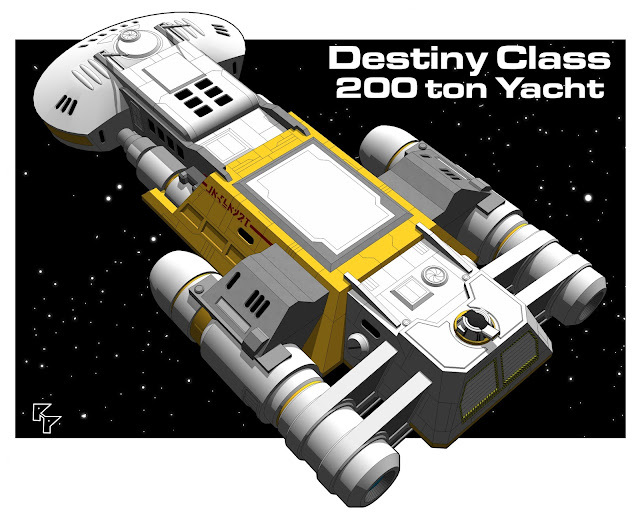 So here is my first attempt at a Traveller yacht. I wanted to make something fast and luxurious, so I went with 4-G acceleration and tried to push the luxury as much as I could: a couple of very large executive staterooms, high ceilings, lots of large view ports, some interior landscaping, and a large, reconfigurable passenger lounge that can act as a dining area, game room, dance floor, or whatever. I took a page from real world luxury yachts (and Traveller's Safari Ship) and added a rear deck for entertaining or to launch recreational craft from, in this case a couple of grav-bikes. Time to push this ship into jumpspace and let the nobles aboard get about their business of stabbing each other in the back. More images to follow. For a higher resolution PDF, click this link: (Traveller Starship Deck Plan Destiny Class). 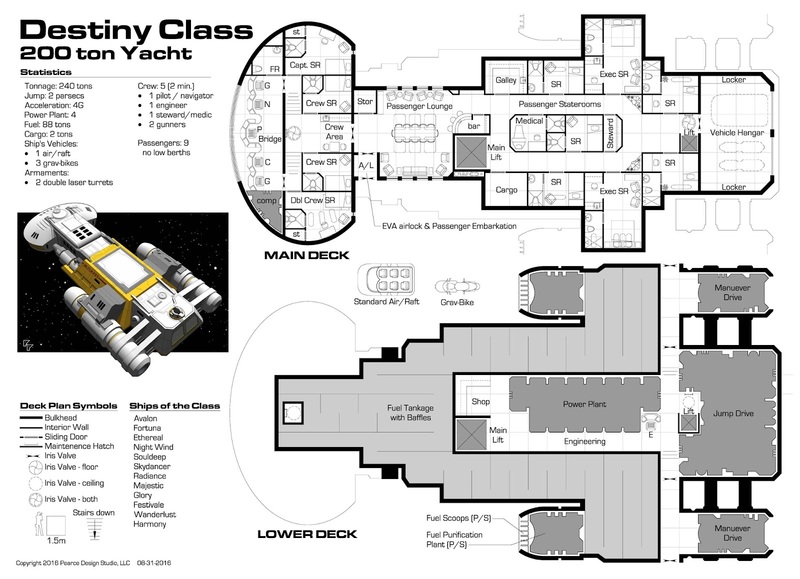 The deckplan was created to be printed out on 30"x42". Scale is 1" = 5'-0" so it can be used with 25mm miniatures. Enjoy! Designer's Note: Unfortunately, I decided to take a new design approach with this ship and was in way too deep before I realized I had gone over my intended tonnage. "In for a credit, in for a mega-credit" as the old saying goes, so I pushed through the design regardless of actual displacement. Purists should know that this design tops out at just over 240 dtons (yikes!). At least I redesigned the fuel tanks to provide additional fuel for the increased tonnage. This is a Book 2 design, by the way. Not that it matters when you've fudged this badly. I could have easily made this entire blog post a rant about the stupid design decisions I made while working on this ship. "Really? The grease covered engineer has to pass through the banquet room to get to his bunk?! Good thinking! Fourteen toilets on the main deck, but NONE in engineering?! I like a ship with quirks as much as the next adventurer, but they shouldn't be designed in!